Whenever we have something exciting or urgent to share with you, you'll find it here. • Now contains turkey rather than pork, the same protein source as the dry diet. •Adjustments have been made to diets to meet the AAFCO 2018 nutrient requirement recommendations. • Reduces the chance of protein contamination for very sensitive food allergic pets. •	Feline wet food containers – an exciting change! • Will now be in cans instead of the foil-topped tins, which should help to eliminate issues with broken seals from transport. some of our novel protein diets. and also for the improvement in consistency. Note: some pets may initially reject the new diet because of the differences and owners may have questions about the difference in appearance. Please consider reaching out to your clients who are feeding their pets Rayne wet diets to let them know that when they are ordering new food, they should allow for the proper transition time to the new diet. If you have any questions or need further assistance, please contact your Rayne representative or contact customer service at info@raynecanada.ca or at 855-850-1410. We’re writing to you to update you on Rayne Clinical Nutrition Product Availability. Our distributor, Pacific Veterinary Services (PVS) made a sudden decision to not replenish their inventory from Rayne and as a result there has been a spike in back ordered items from PVS. In order to fix Rayne’s out of stock and service problems from PVS, we’ve been working diligently to rectify any PVS back ordered items to the Buying Groups. We apologize for any confusion, the coordination for inventory management between PVS and Rayne has not been well communicated. The Buying groups are still rightly ordering from PVS and then for the PVS back-ordered items the buying groups are ordering directly from Rayne. We have been balancing our inventory production to accommodate the inventory levels currently still available to be purchased from PVS. Inventory will be arriving at our warehouse on a regular basis to ensure our full product line is always available. The back-orders from PVS may have been misunderstood to mean they are also out of stock for Rayne Canada in general. Apart from a few items currently in production, this is false information. Hospitals can order from their Buying Group as per usual, and Rayne will fulfill Buying Group orders for items that PVS does not have available. Rayne has stock in our warehouse and Rayne’s production facilities, have no manufacturing issues and indeed Rayne has plentiful supply of product to service the growth of our product. We expect the co-ordination issues to be resolved shortly. bags are currently in plentiful supply. the Rayne Canada warehouse by mid- January 2019.
alternative diets that are also available. Again, we apologize for any confusion that the PVS communication of out of stock has created. Rayne has sufficient inventory and we are shipping to the Buying Groups on a weekly basis. 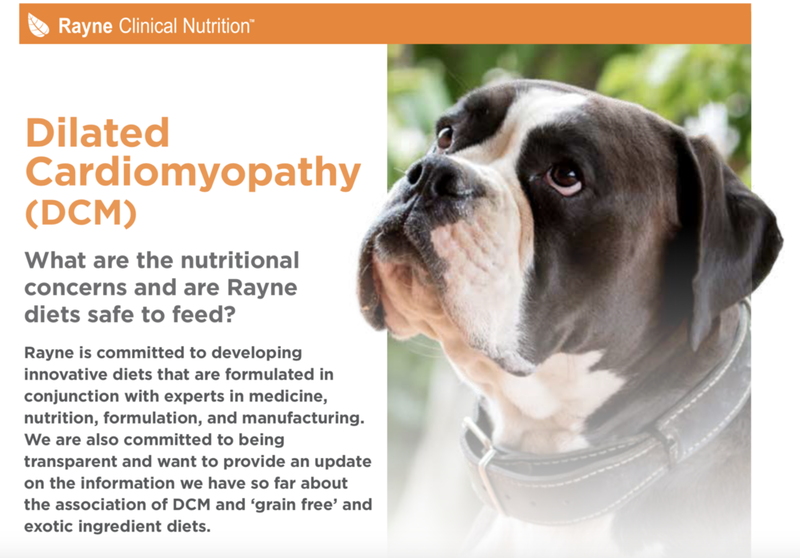 Our Rayne team is dedicated to the health and welfare of all the pets currently on Rayne diets, and we understand how important it is for product to be available. If you have any questions or we can be of service, please contact us.